You are becoming such a big boy, right before my eyes and at an incredible rate of speed. I'm holding onto every snuggle you offer to me and cherishing each and every second. Tonight I wonder if you'll believe the words that I write down to you. I can understand that you won't fully understand any of this until you have children of your own, but please know, every word I write to you comes from this place in my heart that I never knew I had before I met you. I spent quite some time tonight thinking about your cousin Payton, she is turning ONE this Friday and I'm incredibly sad about how quickly the first year of her life has come and gone. I know that in nine short months I will be saying the same about your first year of life and I'm already dreading that moment. I now understand why parents nearly plead for time to slow down, I would give anything to have more time with you as a baby, more time with you each day. Do you hear the words I'm saying? I am with you each and every minute of each and every day and it does not feel like enough. At fourteen weeks old we have not parted yet. I love it this way and can't really see a time anytime soon where I will feel like I need a "break" from you. I do not feel overwhelmed by you in the sense that I need some "me" time, like many mothers do. I know that to maintain a healthy mind and body that I will eventually need to do something by myself, for myself, but I have no idea when that will be. The plan is for me to return to campus for school (rather than taking online classes) in January and I am having the hardest time trying to figure out how this is going to happen. I need to be making a plan now, finding a way, but I end up crying before I can make any progress. Breastfeeding complicates things a bit and switching to formula is not going to happen so with you being my number one, I will make all of my plans according to you and what is best for you. You are amazing me with new things each day. These days you are talking my ears off several times a day. Prior to this week you would talk in the mornings while on your changing table while I got you ready for the day and usually at night right before bedtime as well but now you will just begin talking at random times all throughout the day. Your voice is so cute and definitely a boys voice! You are loving your hands more and more each day and they are continuously in your mouth. I was beginning to think that you were teething, but now I'm thinking that you are just becoming more of a big boy, which means that you will be putting things in your mouth for the next year or more. You are still rolling over from stomach to back but you're sneaky about it and will usually do it when I run out of the room. I have only actually seen you do it once! You have started to do a loud squeal when you get angry and will work it until you get mad enough and start crying. You have become an expert on arching your back and throwing your head back -- nobody warned me that this started so young! You hate your carseat this week when it is in the car and we are driving, otherwise I could carry you around in it all day and you wouldn't mind. 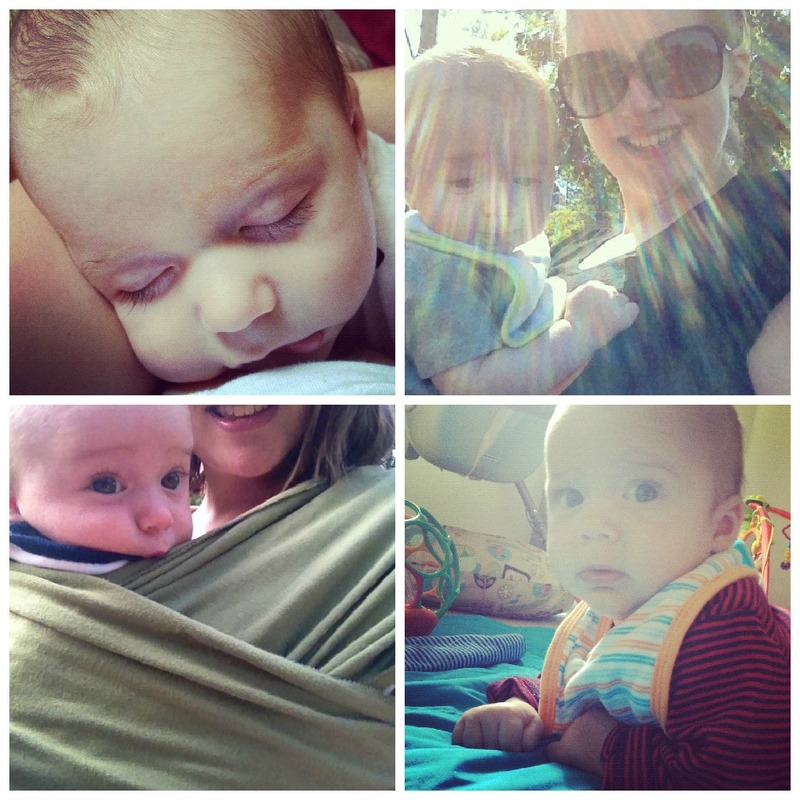 We are putting the Moby Wrap to lots of use lately and I would definitely consider it a life saver. You have decided that you don't like naps this week and I literally can't get you to sleep during the day unless we go on a walk with you in the wrap or we run errands. You are still so great at night and I am still so thankful for that. I am putting you in your Bumbo a few times each day and you really seem to like it (for about ten to fifteen minutes, of course)! I am also putting you down for tummy time two or three times each day because I want you to get used to it and it is good for you. You have been holding your head up so well since you were about a week old (crazy!) but now you are standing on your legs incredibly well and impressing people left and right. You are one strong boy, Cooper James! Baths are still fun to you and so is being bounced. I'm really loving this stage that you're at now. If you start to get fussy I can almost always divert your attention and get you smiling. Speaking of your smile -- it is showing so frequently, dimple and all, and I love it so much. When you smile it shows on your whole face, your eyes are smiling too. We used to say the same about your cousin Payton, you can see her smile all over her face. I love you more than ever, my sweet baby. I love the little person you are becoming and I love that I get to see every moment of it. My prayers for you this week are that you will always be an honest person. I pray that you will always respect your elders and love fiercely. I pray that you will appreciate all that you have. I pray that the end of each day for us comes with hugs and kisses. That first picture...that DIMPLE! Ohhh, I die. Precious. Right? I'm SO in love with it. Cutest. Thing. Ever. 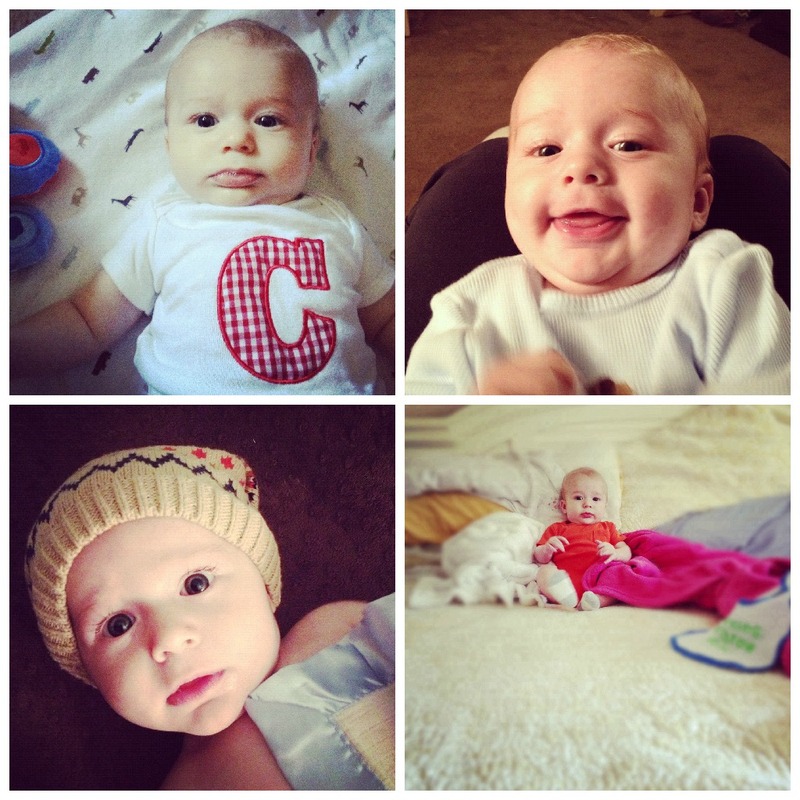 I really like the C onsie & the first one :) Stylin little guy. Happy 14 weeks!! His onesie and that hat...adorable! 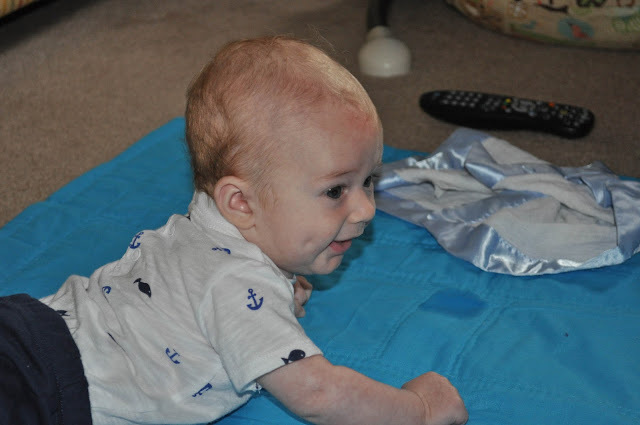 These have got to be some of the sweetest letters from a mom to her baby, ever. I love these posts of yours. My friend just bought me a moby wrap cause Philip is to little for my ergo and I'm so excited! I can't wait for it to get here!